Promotional still for the 1977 film "Star Wars: Episode IV: A New Hope." The franchise is holding an open casting call today in Chicago. Promotional still for the 1977 film "Star Wars: Episode IV- A New Hope." Attention, young padawans. Lucasfilm Limited, LLC and The Walt Disney Company will be holding an open casting call for "Star Wars: Episode VII," the seventh installment of one of the most celebrated film series of all time, today at Park West from 3 to 8 p.m. The J.J. Abrams-directed sequel to 1983&apos;s "Return of the Jedi," which will be released in theaters on December 18, 2015, is currently in pre-production and seeking two leads to helm the continuation of the thrilling space saga. According to casting director Maryellen Aviano, the "Star Wars" team is looking for a 19-23 year-old man and a 17-18 year-old woman to play the new characters; which, considering the desired age ranges, could very well be the descendents of Luke and Leia from Episodes IV-VI. The search for the new faces of "Star Wars" will continue in other major cities throughout the United States, Ireland, and the U.K. before a scheduled production start in spring 2014, with casting directors accepting online submissions as well. However, considering the number of connections that the Second City has to the iconic franchise, finding the next jedi in Chicago may not be a stretch. 1. Harrison Ford (Han Solo) was born here. Ford was born at Chicago&apos;s Swedish Covenent Hospital, raised in Des Plaines and later Park Ridge. He attended Maine Township High School, where he failed at sports and never earned above a C average. After getting involved in theatre during his final year at Ripon College in Wisconson, Ford moved to California in 1964 with dreams of becoming an actor. He worked mostly as a carpenter in L.A. until landing a breakthrough role in Ron Howard&apos;s 1972 film "American Grafitti" at age 30. Now, the 71-year-old actor will reportedly return as Han Solo, the role that made him an international superstar, in J.J. Abrams&apos; reboot. Fingers crossed that a fellow Chicago native will star alongside him. 2. Jake Lloyd (Young Anakin) studied film at Columbia College. Lloyd is a former child actor best known for playing a young Darth Vader — or as Newsweek called him at the time, "Mannequin Skywalker" — in the first dud of a "Star Wars" prequel, 1999&apos;s "Episode I: The Phantom Menace." Lloyd was torn apart so mercilessly by critics for his Razzie-nominated performance that he only acted in one more role after that, then never again. With the claim "fame turned my life into a living hell," Lloyd destroyed all of his "Star Wars" memorabilia and left Hollywood for Chicago, finishing up a film degree at Columbia College in 2012. After working with George Lucas at age 10, it seems fitting that Llyod would continue his film education at Columbia: the alma mater of Steven Spielberg&apos;s longtime cinematographer, Janucz Kaminski. Perhaps a career behind the camera might be a better fit? 3. The original &apos;Star Wars&apos; CGI effects were made in Chicago. The first "Star Wars" film, 1977&apos;s "Episode IV: A New Hope," was filled with groundbreaking special effects that would later spawn companies like Industrial Light & Magic and Pixar Animation Studios. But director George Lucas turned to a Chicago institution for one particular scene: a military briefing of an attack on the Death Star, which required a 3-D rendering of the spaceship and the trench through which X-Wing fighters would travel to ultimately exploit its weakness. Lucas asked Larry Cuba, a then 27-year-old research associate at the University of Illinois at Chicago, to kickstart the animation. Cuba was known for his work with cutting-edge computer animations at the Circle Graphics Habitat, now known as the Electronic Visualization Laboratory, or EVI. He and his team used programming languages developed by fellow computer scientist Thomas DeFanti as a basis for producing the 3-D computer graphics for "Star Wars," and former students like Steve Heminover designed the laser graphics special effects. More than 25 years later, the actual Vector General computer that was used to produce the Death Star animation remains in Chicago, housed in Heminover&apos;s South Side workshop as a piece of true cinematic history. 4. George Lucas is married to a Chicagoan. Not only did Lucas marry Windy City native Mellody Hobson at Skywalker Ranch in Marin County, Calif. on June 22, 2013, he also hosted a second wedding celebration at Chicago&apos;s Promontory Point just a few days later. According to the Hollywood Reporter, the lakeside reception was quite the star-studded affair. Among the most notable guests were Mark Hamill (Luke Skywalker), Carrie Fisher (Princess Leia), Hayden Christensen (Anakin Skywalker), Robin Williams, Jesse Jackson, "CBS This Morning" co-anchor Gayle King, Al Roker of "Today," CNN contributor Van Jones, actress Rachel Bilson, Grammy winner Ne-Yo, Penny Pritzker, and Mayor Rahm Emmanuel. Prince also performed with a 22-piece band. Hobson is the chair of DreamWorks Animation SKG, Inc., head of the Chicago-based investment management firm Ariel Investments and chairman of Ariel Mutual Funds. She also contributes financial analysis for CBS News. 5. Roger Ebert championed Lucas from the start. In one of his most memorable first reviews for The Chicago Sun-Times, Ebert likened the debut "Star Wars" film to an out-of-body experience. 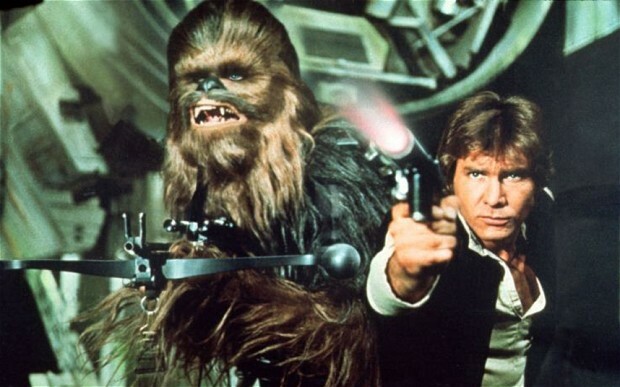 "The magic of &apos;Star Wars&apos; is only dramatized by the special effects," he wrote. "The movie&apos;s heart is in its endearingly human (and non-human) people." He awarded Lucas&apos; original work the full four stars, an honor that he would also bestow upon "The Empire Strikes Back" and "Return of the Jedi." In fact, Ebert might have been the biggest "Star Wars" fan of any major critic. He even enjoyed "The Phantom Menace" and "Revenge of the Sith," citing the former as "an extraordinary acheivement in cinematic filmmaking." In 1983, Ebert and partner Gene Siskel memorably sparred with critic John Simon over his negative assessment of the "Star Wars" films on Nightline, and Ebert defended them with every fiber of his being. His favorite of the six films he saw in his lifetime was the second, "Empire Strikes Back." In his 1997 review of the film&apos;s re-release in theaters, Ebert wrote, "It is because of the emotions stirred in &apos;Empire&apos; that the entire series takes on a mythic quality that resonates back to the first and ahead to the third. This is the heart." 6. A ‘Star Wars’ holographic video effect was used in Chicago on Election Night ’08. In a historic TV first, the human hologram effect long associated with "Star Wars" was used as technological tool for CNN during its 2008 Election Night coverage in Chicago&apos;s Grant Park. CNN reporter Jessica Yellin and Black Eyed Peas musician William James Adams (will.i.am) looked as though they were in the network&apos;s New York City studios talking face-to-face with hosts Anderson Cooper and Wolf Blitzer, when in reality, they were in Chicago at Barack Obama&apos;s rally. According to the Chicago Tribune&apos;s report of the "freaky" effect, the process involved Yellin and will.i.am standing in front of a blue screen in a special tent, while being shot by 35 HD cameras. 7. Chicago’s Legoland has a ‘Phantom Menace" exhibit that is better than the movie. Considering that Episode I remains a putrid mess of wasted opportunity — thankfully, Episodes IV, V, VI and even III make up for it — an awesome exhibit at Chicago&apos;s Legoland Discovery Center, open to the public now through December 2013, brings the scenes of "Phantom" to new life. The Lego Star Wars miniland exhibit, voted on by the public to commemorate the characters and events of the first prequel, features a large-scale Lego model display built from half a million Lego bricks. If you&apos;re a kid who loves "Star Wars" legos, or just a kid at heart, this mini-world of wonder beats the atrocity that is Jar Jar Binks any day. Bonus: Chicago actors are notoriously amazing. To those auditioning at Park West today, may the force be with you! Leah Pickett writes about popular culture for WBEZ. Follow her on Twitter @leahkpickett.